Z3 e36 - yes or no? So, I am in the market for a cheap but relatively interesting car that I will use for a daily drive commute. I am thinking some basic upgrades to suspension, ditch some weight and maybe segue it into a track day car. Is the e36 based Z3 a good choice? Probably a 4-cylinder, M44(?). I know that I am talking about a car that’s probably the best part of 20 years old. I am more than comfortable with a mechanical ‘refresh’, as I say, I am expecting to be renewing suspension bushes, struts etc. so why not upgrade a bit? I don’t know anything about ‘contemporary’ (it’s not really) BMWs, so what are the pitfalls with this car? I love that car in the coupé format. (I saw you mention this in another thread and was going to comment, but didn't get to it.) At the time it was the stiffest chassis BMW had ever built. If I get around to another very silly swap I'd love to take one of these (e36/8) and drop an LS motor into it. I had an M44 engine in a 318Ti a lifetime ago that embarrassed some poorly driven Porsches at one point. If you could find a '95 with the OBD1 it would be a simpler ECU, and simpler to drop a '95 M3 engine into down the road. Just sayin'. Can you track the rag top with a roll bar? z3 convertible...NOT a good track car unless you put a roll CAGE (not just BAR) in it. even then, as an instructor, i won't get in a convertible at the track. with or without a roll cage. not worth the risk. z3 coupe..fun track car. they are e36 chassis, but the entire rear suspension and driveline is out of an E30. the car is a bit of a production frankencar. By ‘track car’ I am not referring to anything competitive, more something I can take out on track days (the kind of events other people have (empty) baby seats in their cars for). As for the coupes, I agree with all comments but they seem to be extremely rare in Australia. I have seen a couple but a cursory glance at the cars for sale show none available. I figure e36 mechanicals are about as late as I want to go to avoid complications plus later engines seem to have more design weaknesses. I mainly just want to avoid buying a ‘cheap’ car that then needs massive repair bills. Hey! I represent that remark! :) The s54 is special in a lot of ways, not all of them good. I'm not sure I'd take one of the newer direct injection engines instead. Honestly, I'm really digging my built M10- and the new TEP exhaust showed up yesterday... In such a light car they're totally up to the task. The coupes are very rare here as well. When you get the chance dig up the back story. It's great. what you really want is an E30 325.
easy to fix and work on. most of all....a blast to drive...street or track. They are great cars. Been using mine as a daily for 2 years now, it has it fair shares of ups and down but most of the time it get me to and from work just fine. I’d get a Z4....I have a 2003 with the 3 liter and 6spd manual...very fun car and fairly quick. It’s also aged well, most think it’s a few years old and you can find one with modern stuff like nav, Bluetooth for phone, xenon, etc. I'd probably steer clear of the roadster if you want to do any serious driving. It's pretty flexy. I have an M44 Z3 Roadster, and it's fun to tool around in, but if I want to get out and play, I love my M54 Z3 Coupe. Such a blast to drive. If you want an E36 chassis, stiffness, and an M44, get a 318ti. If you don't mind a little bigger E36, the 328 is a fun car to drive and is comfortable to boot. I've never owned an E30, but I'd have to agree that it's a viable option as well. My wife asked me this morning as we were winding through some twisites in the 650i; "you're having fun with this one, which cars are your favorites". I told her that the Z3 Coupe and the 2002tii were absolute keepers. The rest could be quickly sold to swap with something different without an ounce of regret. I daily the 650i, but love to just go out in the 2002tii for a "one-on-one" with the car on weekends. I took it out for about an hour today. 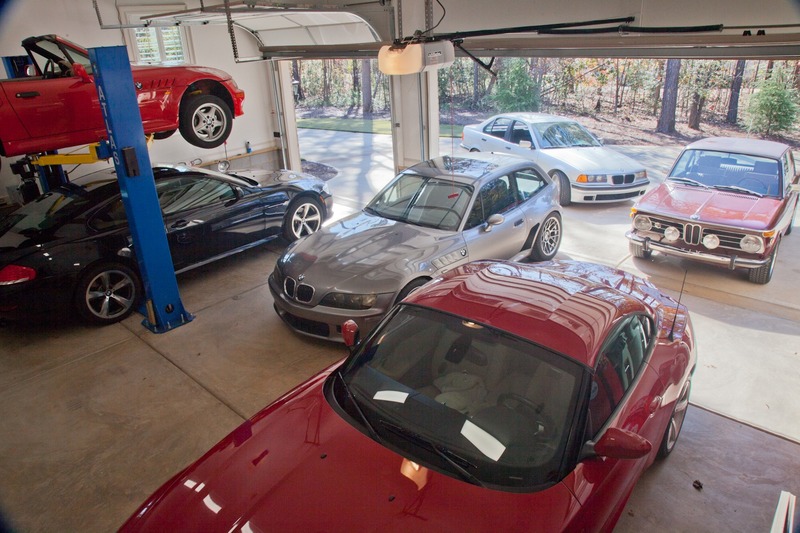 Nice garage! How big is it? Thanks. 24x36. I also have another garage in the basement, so none of the cars sit outside. How high is the ceiling? Looks like the lift fits perfectly, with plenty of room above with the car on it. I can't recall exactly, but I'd say about 13-14 ft. High. The lift came from my old house which only had 10-1/2 foot ceilings, so it's a low-clearance version. 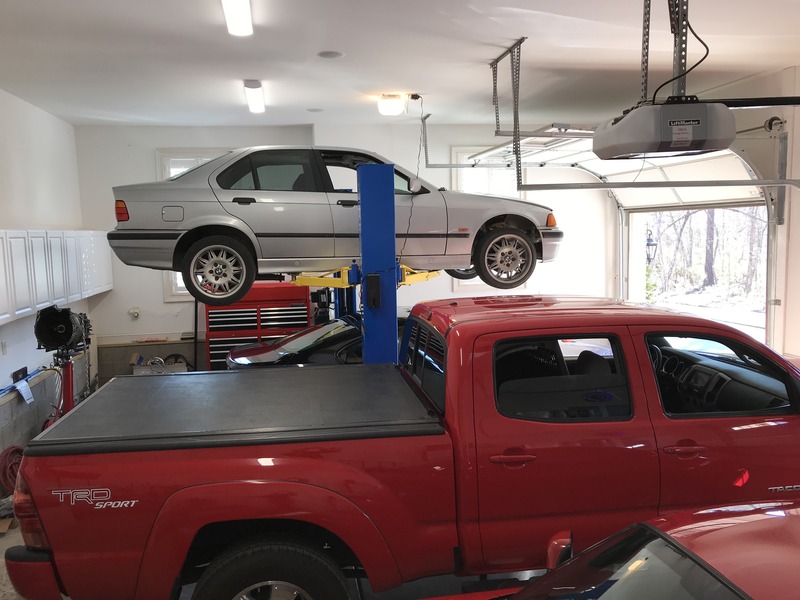 You can see there's still a couple of feet of clearance between the E36 hood and the raised garage door, so a taller lift would work without modifying the door tracks. I built the house with the large radius garage door tracks to gain more clearance. If I started from scratch in this house, I'd have bought the 12' lift. One downside of the shorter lift (other than whacking my head on a tire once in a while) is the cables and hoses run across the floor and not over the top. There's a ramp to protect them, and it's a pain to drive up and over it. I will just keep fishing around and see what I can find. I'd still say E36, whether it's a compact (ti) or a standard E36. I consider the E36 as the last of the "driver's cars". I went from an E36 M3 to an E46 M3 a few years back. The E46 was an awesome car, but I found it a bit too porky for my taste. I ended up going back to an E36. Of course this is just one person's $.02.